While renewables are on the rise, coal usage across the globe remains about the same. To understand why, developed countries must take a look at the political and market challenges facing the developing world. When it comes to the environmental aspects of energy consumption, coal is the least desirable of the major fossil fuels. After all, coal is the dirtiest of them all, with a plethora of negative externalities from local air pollution to CO2 emissions with international climate effects. 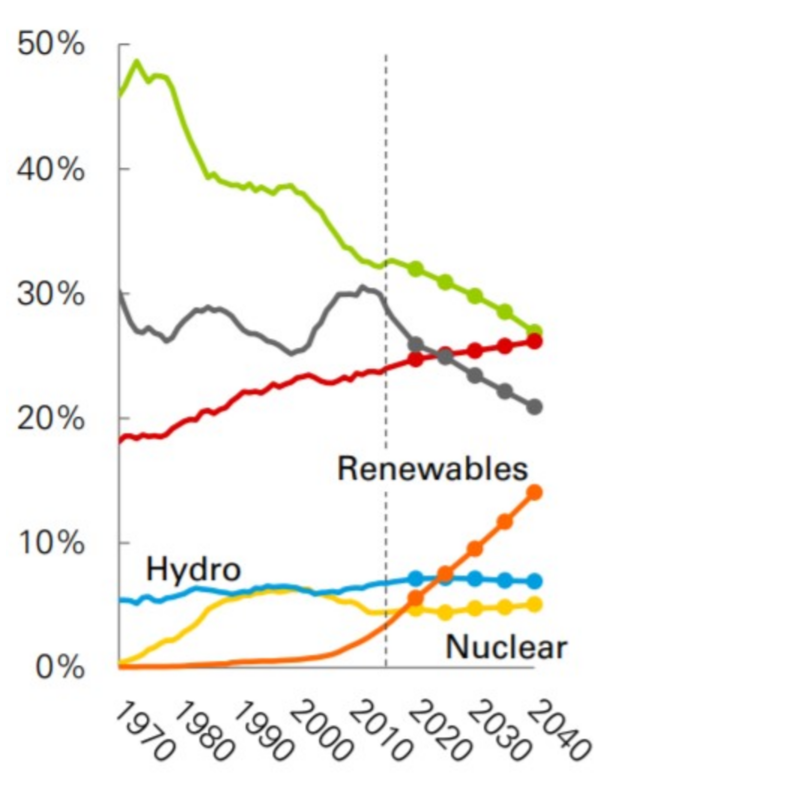 But this realization does not mean a rapid departure from coal in all energy markets. In fact, 2018 was a record year for coal (Mooney and Dennis 2019) emissions and numerous outlooks predict that the level of global coal consumption could remain at fairly stable levels through 2040 (Mikulska and Maher 2018). This policy digest identifies and explores systemic reasons behind countries’ decisions to keep coal as a significant portion of their energy mix. On this basis, it formulates recommendations for policymakers in government, climate action groups, and the energy industry. Coal is generally used for the purposes of generating electricity and, to a much lesser extent, space heating. Besides CO2, emissions generated in burning coal include sulfur dioxide, nitrogen oxides, mercury, other heavy metals, and particulate matter such as fly ash and bottom ash (EIA 2019). While there are ways in which non-CO2 coal emissions can be significantly reduced, CO2 emissions are more difficult to address (EIA 2018). Coal-fired power can be substituted with relative ease with natural gas-fired power and—to a good extent—nuclear power, especially when accompanied by natural-gas-based generation. Both options are more costly (with the U.S. being a significant exception) but cleaner in terms of CO2 emissions. Nuclear is more costly than gas, which experiences other limitations related to a very high upfront cost, nuclear waste concerns, and operational risks. Though natural-gas-combined cycle power generates CO2, it does so at approximately 40% the rate of coal. It is also possible to substitute coal with renewable energy sources such as wind and solar. But due to their intermittent nature, this substitution cannot be complete unless other non-intermittent sources (i.e. natural gas, nuclear, hydro) are operating to provide back-up power or/and there is a rapid access to storage readily available. Hydro, the one large-scale renewable source of energy is not always a good substitute either, since not all countries have hydropower potential. And it is also not without environmental concerns—as it disrupts local ecosystems and can strain local communities (National Geographic 2009). The share of coal in the global energy mix is decreasing and will continue to decrease through 2040 (Figure 1). This is due to several factors including cheaper natural gas available from new sources of supply, such as the U.S., Australia, and Qatar, and deliberate policy choices that promote cleaner energy sources. But looking only at shares leaves out an important piece of information: the absolute levels of coal consumption. It is the latter that determines the level of emissions. And to the dismay of many, coal consumption remains approximately the same—even two decades from now. More granular analysis reveals why this is the case. 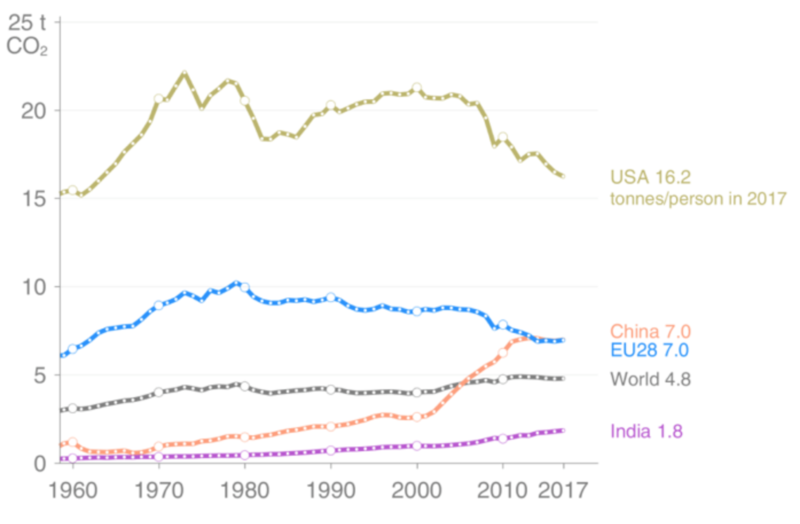 Decrease in coal consumption takes place in the developed (OECD, 2018) world, particularly in Europe and North America. However, this decline is compensated by growth in coal consumption in developing economies particularly in Asia. Much of the increase in coal consumption in developing world relates to, well… development. As societies move from agricultural to industrialized, their need for energy increases, often manifold. Access to affordable energy sources becomes a key to economic growth. As such, coal fits the bill quite well. Not only is coal generally cheaper than its alternatives, it is also more spread out geographically and available domestically in many developing countries, which precludes potential geopolitical meddling by a foreign power. In addition, coal mining employs a well-established, relatively simple technology with an end product that is easy to transport and store. The coal industry is also labor intensive, an advantage in the developing world where a cheap labor force is supported by a booming population. Even though coal generates more pollution than other sources of energy, the concern is often of secondary importance to many people in developing countries living in utter poverty and lacking access to food, clean water, medical care, let alone any reliable energy source. According to the World Health Organization, approximately 3 billion people with no access to electricity use open fire and simple stoves, which fueled by kerosene, biomass, and coal pose serious danger to their lives and health. Of those 3 billion WHO estimates that 4 million of those people die prematurely because of exposure to household pollution (2018). One can definitely see how CO2 emissions take a back seat here. In contrast to regular air pollution, CO2 emissions cannot be seen or felt and its negative effects are diffused geographically and over time. Two major factors seem to shape coal consumption around the world: policy and market. Policy can either support or discourage the use of coal. Examples include environmental legislation that at an extreme precludes the use of coal altogether. More common is legislation that prohibits the emission of certain chemicals, prescribes the use of a specific technology to decrease emissions, or establishes a price, i.e. carbon tax. Such policies make the use of coal costlier and less competitive against alternative energy sources. They also increase the price of energy altogether. Policies that subsidize other sources of energy, such as renewables, make coal less competitive but do not increase energy prices overall. Of course, policy can also promote coal by making it more competitive via direct or indirect subsidies or by establishing an obligatory coal quota in electricity generation or a country’s energy mix. Market determines the competitiveness of coal against its potential substitutes. In most cases, absent policy intervention, coal is cheaper than those substitutes, particularly when it can be sourced domestically. Coal deposits are much more democratically distributed around the world than natural gas or oil resources (Maps of the World, 2017). However, in countries where alternatives are widely available at relatively low prices, coal is likely to be pushed out based on economic considerations. Most prominently this includes the U.S., where the shale revolution unleashed an ample domestic supply of cheap natural gas (Harrison et al. 2018). Together, policy and market factors influence countries’ energy security considerations. Energy security relates to the ability of any given country to provide a sufficient supply of energy at a reasonable price. As such, domestic resources—like coal in many countries—are particularly valued, since they do not rely on other countries’ willingness to trade. This includes both geopolitical considerations and economics, i.e. prices are lower due to lower transport costs and are not predicated upon the bargaining power of other countries. Policy, market, and energy security have a major impact on any country’s energy mix. The relative influence each of these factors is also not random but predetermined by each country’s characteristics. Per analysis in the first part of this brief, two factors come to the fore: economic development and easy access to coal alternatives. Development and access to alternatives create a two-dimensional framework along four quadrants: A) developed with easy access to coal alternatives; B) developed with difficult access to coal alternatives; C) developing with difficult access to coal alternatives; and D) developing with easy access to coal alternatives. Income is generally a useful way to operationalize the level of development and a key to understanding why developed countries are more likely to turn to coal alternatives. In developed countries, wealthy populations are more likely to express their preferences for clean environment (water, air, food) and climate change. Higher income allows the abandonment of cheaper, higher-emission fuels like coal and the movement to more expensive, lower-emission fuels like gas and renewables. As such, developed countries are better situated to implement policies that either deter coal directly or indirectly by subsidizing lower-emission energy sources. In contrast, market forces can oust coal in both high- and low-income countries if competitively priced alternatives exist. The U.S. is a great example where coal has been pushed out by cheap natural gas that came from shale deposits (Fox, 2018). Developing countries such as Nepal, Democratic Republic of Congo, Namibia, and Paraguay do not use coal—or other fossil fuel sources to generate power since they are abundant in hydropower, which generates most—and often all—of their electricity (Fox 2018). By the same token, ninety-nine percent of Costa Rica’s electricity comes from hydropower, renewables (wind, solar, biomass), and geothermal sources (Embury-Dennis 2017). On the other hand, where coal alternatives are not readily available (due to economic, policy, technology, or other constraints), energy security considerations can strengthen a country’s attachment to coal despite high(er) income levels. This is well illustrated in Central and Eastern Europe, where energy security considerations in countries like Poland, are one of the major reasons the country has held on to coal despite a heavy anti-coal push from the European Union (Mikulska 2018). In truth, each country is situated somewhere on the spectrum across the two-dimensional sphere of development and access to resources. But categorization is useful as it furthers our understanding of a country’s motivation behind coal’s role in their energy mix and discourages our vilifying countries that seem reluctant to move away from coal. It provides a platform for mutual understanding in the universe of highly diverse countries. It also facilitates better solutions by offering useful insights into which policies can 1) support a country’s economic development, 2) provide access to clean air, water, and food, and 3) heed the message of global climate action. As pointed out in this digest, the move toward low-emission energy sources in the developed world—while helpful—will most likely not be enough to decrease global CO2 emissions. This is predicated upon the fact that nearly all global population growth takes place in the developing world where, as follows, the majority of global economic growth occurs (Figure 4). If you look at the relationship between income and energy consumption there isn’t a single country in the world that has achieved high income without high energy consumption. In high income countries, electricity consumption is at least 4,000 kilowatt hours per person per year and in the U.S. it’s about 13,000 (Salvaterra 2019). 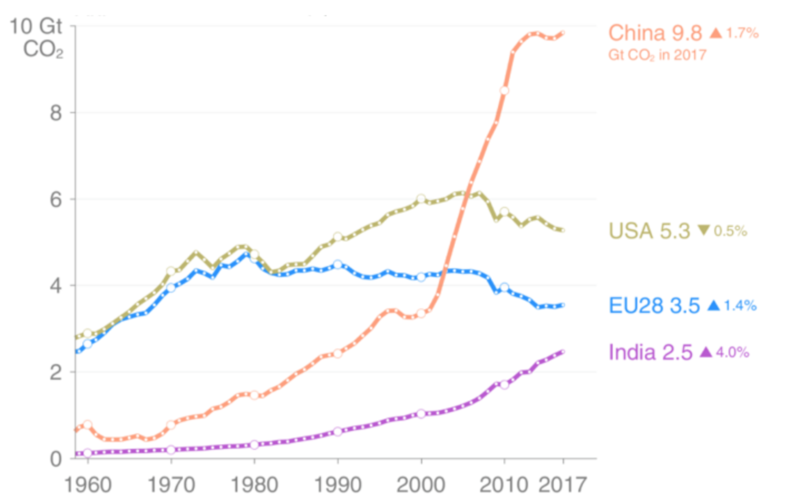 Meanwhile, China sits currently just above 4,000 and India at 900 kilowatt hours per person per year (IEA)). 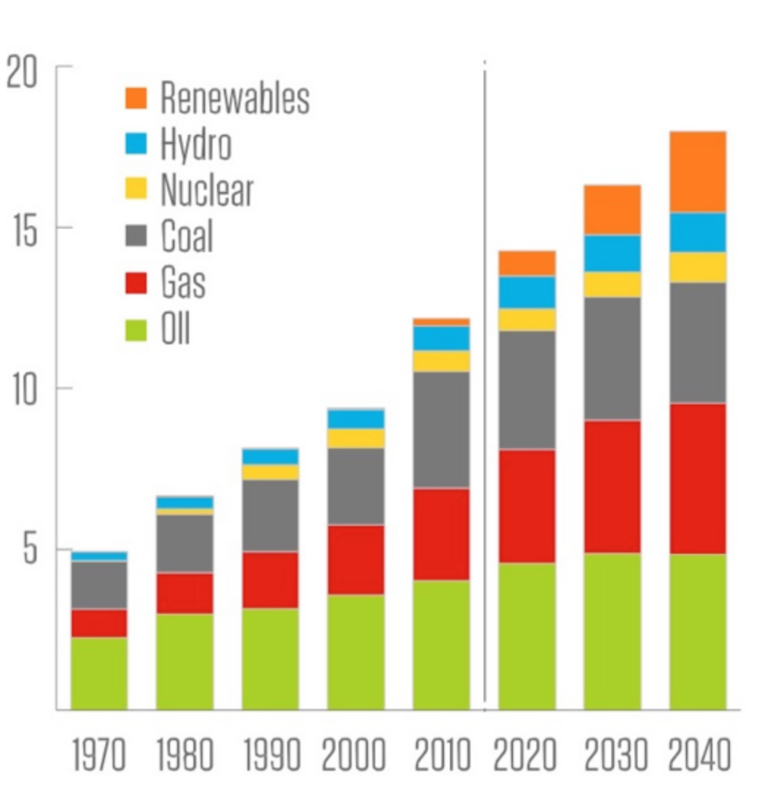 Without a major technological breakthrough—under a “business as usual scenario”—most developing countries will continue to rely on fossil fuels for most of their energy needs and, as indicated by many major energy outlooks (Mikulska and Maher 2018), will increase their coal consumption (China (IEA 2018a) being the notable exception). Developing countries will also become increasingly dependent on other countries for energy sources such as oil and natural gas. The energy security dimension of widely available coal may prolong coal’s life beyond what competitive fuel prices and environmental considerations suggest. While the developed world won’t drive the growth in energy demand directly, it can have a meaningful impact on demand that extends beyond its own transition to cleaner fuels. The ability to do so will be linked to two things: 1) an understanding of the many obstacles the developing world faces with respect to energy demand, and 2) a real-world awareness that a global move to 100% renewable energy is impossible within the next several decades unless an unanticipated technological breakthrough takes place. This realization needs to be present at both the domestic and international level, including country-specific policies, multilateral negotiations, and international climate agreements. It also needs to be reflected in the way we approach research on energy demand and climate. An increasing number of sources point out that current efforts to move toward renewable and cleaner energy sources will not be enough to achieve the global climate goals of 1.5 or even 2 degrees Celsius (U.N. Environment 2018). 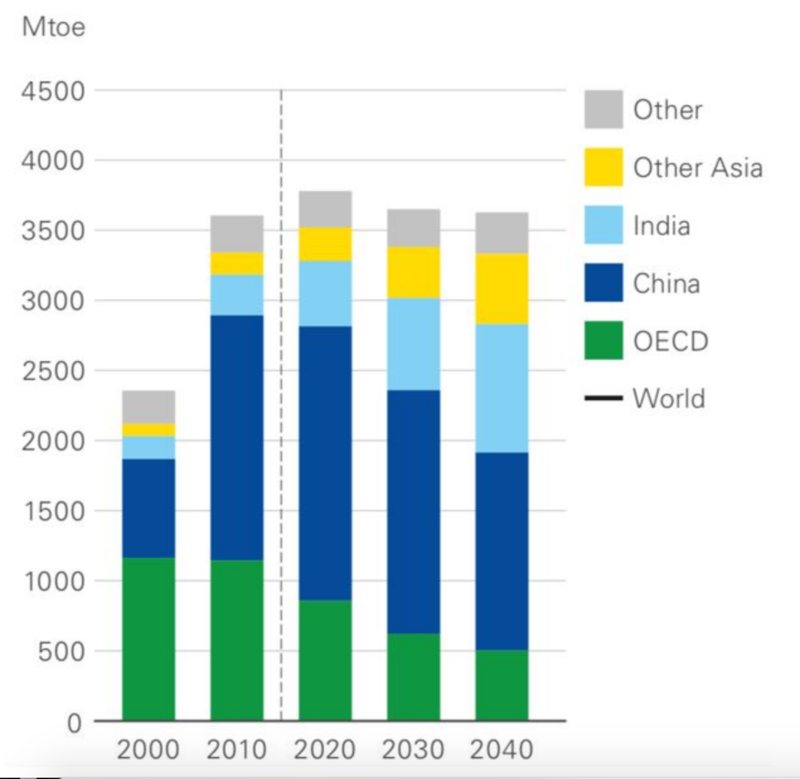 Other methods need to be employed to help decarbonize the fossil fuel energy that the developing world is bound to use (IEA 2018b). These include carbon capture and storage (CCS), hydrogen fuels, nuclear energy, and methods to remove existing CO2 from the atmosphere. If we only focus on one way of dealing with emissions, we may be missing opportunities elsewhere. After all, we don’t know where the next technological breakthrough will come from. It may be a breakthrough in battery storage, but it could just as well be a breakthrough in capturing CO2. The role of the affluent, developed world as a leader in broadly understood climate action cannot be overstated. Taking into account the economic realities that are associated with energy transition. As pointed out by Ken Medlock, senior director of the Center for Energy Studies at the Baker Institute during the Senate Committee on Energy and Natural Resources hearing, the developed world must lead by example, particularly in the area of research and development (R&D) (U.S. Senate Committee on Energy and Natural Resources 2019). R&D is crucial as it can substantially lower the cost of coal alternatives and in so doing provide a reason for many developing countries to wean themselves off coal. It can lead to cheaper, non-intermittent renewables, or cheaper natural gas (i.e. cost improvement in extracting natural gas or in the liquefaction process). In addition, R&D can help emissions by exploring ways that can substantially lower or eliminate CO2 emissions from burning coal—addressing not only countries’ concerns about cost but also about energy security. Lastly, research can look into the possibility of removing CO2 from the atmosphere. By engaging in research that considers all possible approaches, the developed world can gain some credibility when engaging developing countries in the climate change action. After all, it is the developed world that is responsible for most of the CO2 that is currently in the atmosphere. Asking developing countries to forgo economic growth seems not only unfair but an impossible request. Serious engagement in action that could help both climate and economy can—at the very minimum—be seen as a start for a constrictive dialogue. From the developing countries’ perspective, it is important that they remain open to new approaches to energy and are ready for a dialogue with the developed world. Ideally, they would also develop their own strategies for fighting carbon dioxide emissions or would be willing to work with the developed world on research in this area. Common understanding fostered in the process would lead to more effective international agreements. Since there is no global executive to enforce the policies agreed on internationally, success depends on parties’ commitment. Such commitment is more likely if international agreements include diverse perspectives and acknowledge the challenges that all parties face. Anna Mikulska is a senior fellow at the Kleinman Center for Energy Policy and a non-resident fellow with the Center for Energy Studies at Rice University's Baker Institute for Public Policy. This article was first published by the Kleinman Center for Public Policy and is reprinted with their permission. Of course other factors exist as well but they are less generalizable across different countries and/or regions and therefore, not included in this analysis as it seeks to provide a framework that can be applied across the globe. Indirect subsidies include, for example, worker disability insurance. Coal workers are more apt to become disabled than are others, and national disability insurance policies (such as that available in the U.S. under social security) thereby implicitly make being a coal worker a better job than it would be in the absence of such insurance. Since it’s a better job, employers can pay coal workers less, which creates an implicit subsidy.